In a hymn to Imam Ali (a.s.), it is written that the Commander of the Faithful (a.s.) paid great attention to certain issues during his eventful life. Justice and unity were among the things he always paid great attention to. These are great lessons for us. Unity of the Islamic Ummah was of paramount importance to Imam Ali (a.s.). Administration of justice in the Islamic society was also important to the Commander of the Faithful (a.s.). The fact that he always pursued justice is evident in all cases. He went through the toughest tests of his life – the difficulties and wars which were imposed on him – as a result of administering justice. He tolerated great hardships, such as the three wars he fought during his brief rule. This is because he always sought to administer justice. He always pursued justice decisively. He also gave up his own rights for the sake of God, Islam, and unity of Muslims and never engaged in any confrontation. He always held Islam, Muslims, the Islamic Ummah, and Islamic unity in high regard. The Islamic Ummah has suffered from injustice at all times. It has also suffered from disunity, discord, and conflicts. The world of Islam has always suffered from these bitter realities. The more you refer to the history of Islam – particularly the history of Islam in the recent centuries – the more clearly you perceive these realities. The world of Islam is in need of unity. The Commander of the Faithful (a.s.) should be the focal point of unity in the world of Islam. 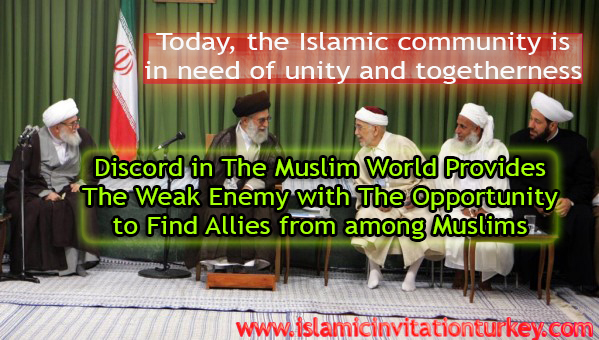 The enemies of Islam are trying to foment discord among different Muslim groups by means of Imam Ali (a.s.) who is himself the source of unity among Muslims. These are facts that the Muslim world should be aware of. Today, you should be vigilant against those who slander the Shia in order to foment discord among Shia and Sunni. The opposite is also true. There are also some people who provoke and hurt the emotions of their Muslim brothers. Muslims should be united. This is what the Muslim world needs today. Today, the Islamic community is in need of unity and togetherness. The Muslim world should not let its enemies take advantage of its weaknesses. These enemies are not strong by themselves. What is Israel? The Zionist enemy is nothing compared to the one and a half billion Muslims of the world. Discord in the Muslim world – the weakness which currently exists in the Muslim world – provides the weak enemy with the opportunity to find solutions for its problems and find allies from among Muslims.This is a fact which the Iranian nation should also pay attention to. We are a united nation. Islam created unity among us. Islam set our Revolution in motion and instilled in our hearts deep love for each other. It made us motivated and inspired us. This helped us turn into a strong force against the enemies of Islam, the Islamic Republic, and Muslims. The enemies are seeking to undermine this unity and cause discord among the people. They intend to pitch Muslim brothers against one another.